A man by the name of Justin McCarthy from Dublin, Ireland is credited for creating the Irish Water Spaniel breed. While they left no breeding records, it is said the breed may be comprised from Poodle and Irish Setter, or the Poodle and the Curly-Coated Retriever or the Poodle and the Portuguese Water Dog, or possibly a combination thereof. In appearance, the dog resembles a brown Standard Poodle. The dogs were used as dual-purpose hunting dogs, working both land and water, with a soft mouth, able to retrieve even in frigid waters. In the 1800s the Irish Water Spaniel was popular in the United States as a duck hunting dog. Unfortunately the breed lost popularity when the easier care Labrador Retriever became more popular. The history of the Irish Water Spaniel is traced back to the mid 1800's when it was discovered as a hunting dog. The Irish Water Spaniel is now considered a rare breed. The Irish Water Spaniel was the most popular hunting dog until the Labrador Retriever replaced it due to the easy grooming of it's short straight haired and water repellent coat. Most often the Irish Water Spaniel was bred as a retriever for water birds and other small hunted game and known for being a daring retriever in the coldest of waters. Although the Irish Water Spaniel looks much like a standard Poodle it is not a part of the Poodle family but a part of the Spaniel family. The Irish Water Spaniel is both the largest and the rarest of the spaniel family. The Irish Water Spaniel is an active, intelligent, alert breed of dogs. It is also a very playful, inquisitive and responsive dog that has a good temperament as a pet, watch dog or hunting dog. Their gentle nature can be nurtured through good training to make them great with older children that know how to handle and treat a dog and around other family members. This breed should be socialized as a puppy if it is intended for a family pet as this will make the family life more comfortable for the dog and the people. This is a breed that can seem aggressive around other dogs if not properly introduced and this is another reason for early socialization with the Irish Water Spaniel. The Irish Water Spaniel breed is often shy and timid around strangers making them great watch dogs and can be easily trained to alert you to any intruder in the home or on the property. They are not an aggressive dog and so they will remain low on the list as an actual guard dog. Other than to alert you to intruders the Irish Water Spaniel is a quite dog that does not bark incessantly and will remain that way from puppy to mature adult. When exercised regularly this breed of dog can be a great pet and companion but with out the right amount of exercise and training they can tend to be a bit hyper due to excess energy that must be burned off through proper exercise and activity. The Irish Water Spaniel is a breed of dogs that does drool and develops more saliva than other average dog breeds. They can also be disobedient with members of the family that have not established a dominant role and therefore can seem unruly at times, this is a dog that requires a strong leadership role. Although with the right training for both dog and owner this is easily corrected and the Irish Water Spaniel can become a great pet with little obedience problems. Irish Water Spaniels that are not socialized correctly can seem timid, shy or unsure of strangers and other dogs so it is important to socialize them as puppies if you intend to have the dog as a family pet or around other animals. The Irish Water Spaniel is a high energy breed of dog that was originally and historically bred as a hunting dog and because of this simple fact exercise is an important and imperative part of the Irish Water Spaniels daily needs. This is a breed that loves to swim, take walks or run for exercise and will be very excited to accompany you on very long walks. Irish Water Dogs also enjoy retrieving many different items and can be trained to fetch or retrieve nearly anything you like. The Irish Water Spaniel will seem to have an endless amount of energy but with good exercise once daily your dog should remain healthy and fit. The amount of exercise you give to your Irish Water Spaniel will reflect in his behavior, by having less energy they will be less destructive to property and much more well behaved in your home. They are most often not off leash dogs as they will chase animals for exercise if given the chance. The Irish Water Spaniel needs a firm and dominant authority figure for training beginning at an early age of puppy hood. When trained early they will make great dogs for your family, hunting or watch dogs. They are highly intelligent and good problem solvers however obedience can be an issue without the proper authority. Professional training is recommended and the owner needs to be present to become the superior figure in the dogs mind, otherwise this is a breed that will often only listen to whom it recognizes as the most dominant figure in it's day to day life. 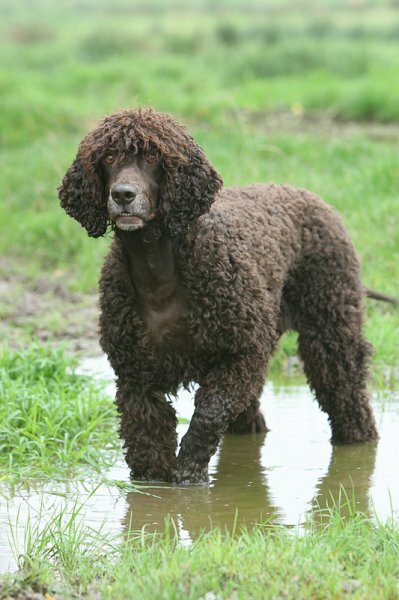 The Irish Water Spaniel has a few Health concerns that it's owner should be aware of and keep a keen eye out for. The most common of these would be Ear infections as this is common in many swimming dog breeds with longer ears and the Irish Water Spaniel is no exception. Ear infections often occur as a result of the water that does not drain from the ears properly and can pool inside causing an infection. Drying your Irish Water Spaniel's ears throughly after swims may help to prevent some Ear infections, but any sensitivity around the ears should immediately be checked by a veterinarian. Other Health Problems to be aware of with this breed is Hypothyroidism, seizures, eye Entropion which can all be inherited and you should inquire about any health concerns with the parents of your puppy before adopting or buying him or her. Because the Irish Water Spaniel is a larger breed of dog hip dysplasia is also a common health condition for the dog as it ages and can be uncomfortable for the dog, proper nutrition and health check ups can help to prevent some hip dysplasia.